Pattie's twenty-four years of daily contact with Ettinger clients and her understanding of the elder law estate planning process, provides the background necessary to serve as a liaison between the firm's clients, attorneys and staff. She is always available to talk with existing or future clients to answer their questions, or direct them to the right person, as well as scheduling appointments in the firm's sixteen offices. 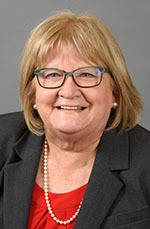 In addition to managing and directing the firm's internal and external communications including the production of all firm publications, guides and seminar materials, she maintains the firm's website, trustlaw.com and publishes the Ettinger Elder Elert, which is distributed weekly to over 21,000 recipients. Pattie also oversees the firm's marketing efforts including scheduling and publicizing our elder law estate planning seminars. Pattie has a BFA from Marymount College in Tarrytown. Before starting with the firm in 1995, she worked in a family owned advertising business. She resides in Saratoga County and has two children and three grandsons.